Fort Lauderdale (Ft. Lauderdale) is used by several cruise lines as an embarkation and disembarkation point for Caribbean cruises. The actual port in Ft. Lauderdale is known as Port Everglades, and it is the third-busiest cruise port in the world, drawing almost 3 million cruise passengers in its 11 cruise terminals. If you were to look at a topographical map of the eastern seaboard of the United States, you will see that Port Everglades is the deepest harbor south of Norfolk. Ft. Lauderdale is often called the "Venice of America" because of its 270 miles of natural and artificial waterways. The city was founded by Major William Lauderdale during the Seminole War of 1837-1838. The city grew rapidly during the land boom in Florida during the 1920s. 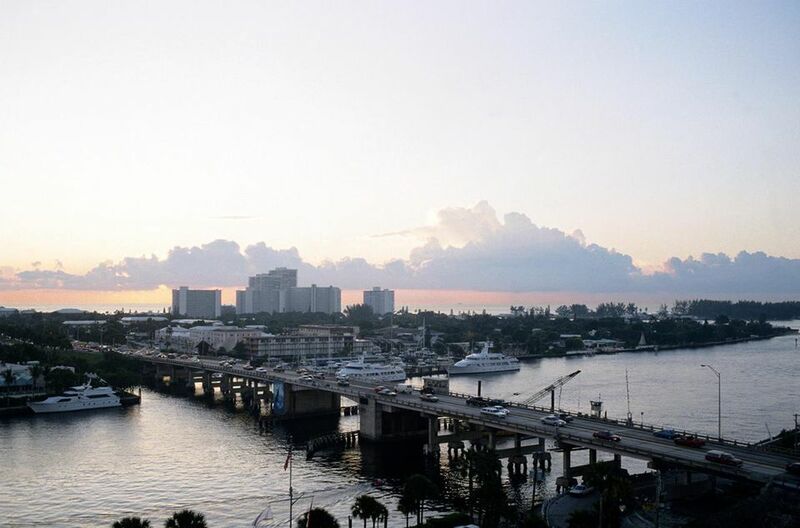 Ft. Lauderdale has continued to grow, and its metro area now has over 4.5 million residents. Port Everglades is an artificial harbor that got off to a somewhat inauspicious start. A developer named Joseph Young purchased 1440 acres in the 1920s for the Hollywood Harbor Development Company. President Calvin Coolidge was brought to Ft. Lauderdale on February 28, 1927, and asked to press the explosion detonator to open the harbor. Thousands gathered to watch the show. Unfortunately, he pushed the detonator and nothing happened! The harbor was unceremoniously opened later that day, and the new seaport was named Port Everglades in 1930. By air -- Access to the large cruise terminal is easy and only about 2 miles (5 minutes) from the Ft. Lauderdale airport. Cruise line buses meet inbound flights for transfer to the port if you make arrangements in advance. If you choose to take a taxi from the airport to the pier, it should cost less than $20. Port Everglades is only about 30 minutes north of the Miami International Airport, so that is an additional option for cruisers. By car -- For those that arrive at the port via car, Port Everglades has 3 passenger entrances: Spangler Boulevard, Eisenhower Boulevard, and Eller Drive. There are two large parking garages that cost $15 per 24-hour period in October 2008. The 2,500-space Northport Parking Garage next to the Ft. Lauderdale Convention Center serves terminals 1, 2, and 4. The 2,000-space Midport Parking Garage is closer to terminals 18, 19, 21, 22, 24, 25, and 26. Both garages have controlled security, are well-lighted, and will accommodate recreation vehicles (RVs) and buses. Those of us who grew up during the 1950s and 1960s remember Ft. Lauderdale as a popular spring vacation destination for college students. Ft. Lauderdale is no longer the "in place" for college students, but it still has over 20 miles of beautiful beaches and great weather. The city also has hundreds of miles of navigable canals and waterways. Ft. Lauderdale spent over $20 million renovating the beach area a few years ago, and the area looks wonderful. Florida A1A shares the beach road with Atlantic Boulevard. If you only have a short time to spend before boarding, you might want to go over to John U. Lloyd Beach State Recreation area across from the port. The park is excellent for fishing or for watching the cruise ships and other craft go in and out of the port. The beach is broad and flat and popular with swimmers and sun bathers. (You can start your tan early!) The beach is also one of Broward County's most important sea turtle nesting sites, and is also home to many of the endangered Florida manatees. Want to do some last minute shopping? Las Olas Boulevard is an upscale street of shopping boutiques, often thought of as the "Rodeo Drive" of Ft. Lauderdale. Las Olas is good for strolling and window shopping and also has several good restaurants. Serious bargain shoppers might want to check out the Sawgrass Mills Mall on Sunrise Boulevard. This mall has over a mile of shops! Another popular shopping area is the Fort Lauderdale Swap Shop, a huge flea market also on Sunrise Boulevard. The Museum of Discovery and Science is a fun interactive science museum with an IMAX Theater. The Museum of Art on Las Olas Boulevard is small, but has a good collection of modern and contemporary art. If you are into history, you might want to check out the Bonnet House. This estate is located on 35 acres and reflects the lives of the "pioneers" of the Ft. Lauderdale area. Butterfly World features over 150 species of butterflies. Visitors walk through a screened-in aviary and have an opportunity to see all stages of the life of a butterfly. If you can't wait to get on the water, you might want to explore Ft. Lauderdale on a day cruise. Riverfront Cruises will take you on a 1.5 hour cruise to see the fascinating sights along the New River, the Intracoastal Waterway, and Port Everglades.